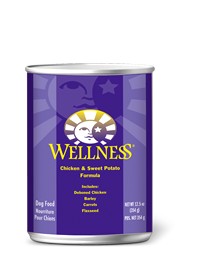 Complete Health Grain Free recipes feature natural ingredients plus super nutrients for adult dogs. These delicious recipes are formulated with a balanced blend of proteins, grain free carbs and select fats, providing the energy your dog needs to thrive. 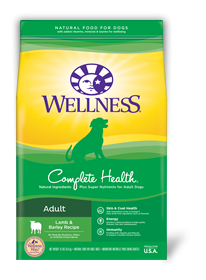 Feed Wellness Complete Health Grain Free and see the 5 Signs of Wellness in your pet, including the following—guaranteed. Available in: 1.81kg, 5.44kg and 10.88kg bags. 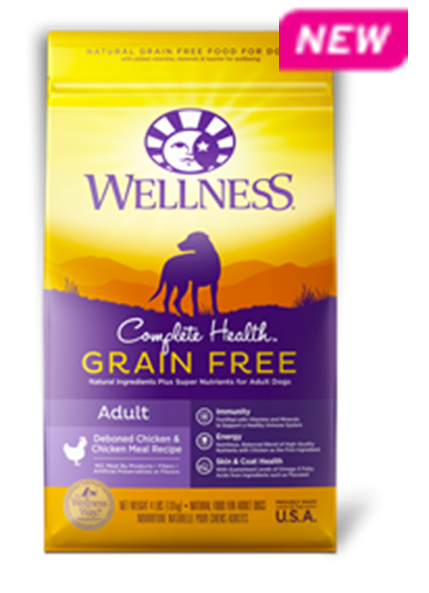 Our NEW Wellness Complete Health Natural Grain Free Food for Dogs has added vitamins, minerals & taurine for wellbeing. Look for the 5 Signs of Wellness in your dog! CALORIE CONTENT (CALCULATED): This food contains 3,509 kcal/kg or 386 kcal/cup ME (metabolizable energy) on an as fed basis.